Small limestone fragment of a scroll cornice. 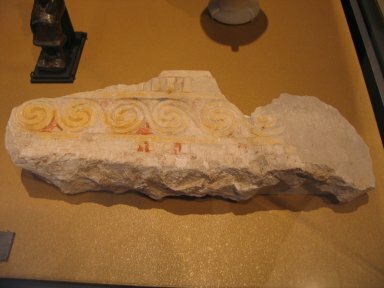 Scroll in raised relief with extensive remains of paint. Condition: Surface weathered and chipped. Scroll retains extensive portions of yellow paint against red background. Portions of the enclosing border retain red, yellow and blue paint. Workmanship good.